Supports FMCNA’s mission,vision, core values and customer service philosophy. Adheres to the FMCNA Compliance Program, including followingall regulatory and FMS policy requirements. Functions as the hemodialysis team leader in the provisionof chronic hemodialysis care and treatment. Provides day to day direction and supervision to assigneddirect patient care staff. Communicates with the physician and other members of the healthcare team to interpret, adjust, and complete patient care plans. Provides safe, effective delivery of patient care in compliance with standards outlinedin the facility procedure manual, as well as regulations set forth by the company, state, and federal agencies. Provide day to day guidance, support and direction to direct patient care staff, providing informal feedback on an ongoing basis and formal feedback input for the annual performance evaluation. Participate in the department staffing and the appropriate hiring, firing and disciplinary actions. Recommend disciplinary action to Facility Administrator and initiate as appropriate. Ensure compliance with all company and facility approved procedures and policies as well as regulations set forth by state and federal agencies. Approve or disapprove time or personnel schedule changes in the absence on the Facility Administrator ensuring compliance with applicable regulations, policies and procedures for documenting time of work hours for staff members on assigned shift. Maintain knowledge in the current practices related to the principles and techniques of dialysis by participating in all scheduled in- services. With Facility Administrator conduct staff meetings at least monthly or as needed to keep patient care staff informed of changes in patient care needs or operations to improve delivery of care. Meet routinely with the Facility Administrator to discuss personnel and patient care status, issues, and information. Assess patient needs, respond to dialysis treatments, and communicate concerns to rounding physician. Implement changes in patient care/treatment as directed. Continuously monitor patient’s condition with regards to problems and potential complications associated with dialysis. Administer medications to patients per physician’s orders. Day to day work includes desk and personal computer work and interaction with patients, facility staff and physicians. The position requires travel between assigned facilities and various locations within the community. Direct Patient Care Staff, Ward Clerk as assigned. Discovering the Dallas - Ft. Worth area. 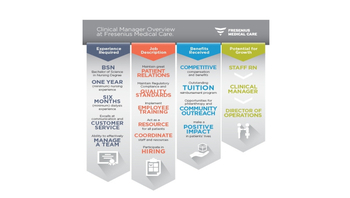 View our infographic to learn more about the Clinical Manager position.